At the end of 2000, the state-of-the-art, Granite Ridge plant in Londonderry was well under construction. AES had just won state and federal approval for the project, after an acrimonious regulatory fight with a grassroots group that fought against the project. New rules of electric deregulation favored big, efficient, clean producers like AES over the aging, smoky, oil coal-fired competition. New pipelines brought natural gas to Londonderry, New Hampshire for use as a clean burning fuel. 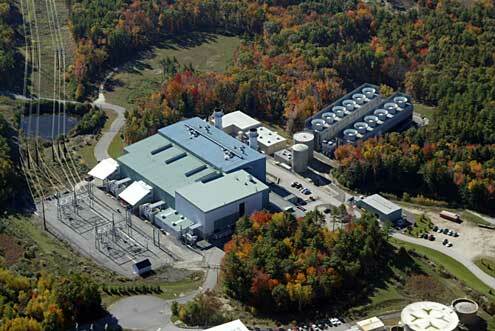 Granite Ridge is a 752 MW natural gas-fired, gray-water cooled, combined cycle electric generating station located in Londonderry, New Hampshire. The Facility operates at a heat rate of less than 7,000 btu/kWh and benefits from a below market long-term commodity contract, making it one of the lowest cost CCGTs in the NEPOOL supply stack. In a continuing effort to maintain a high availability factor, the Company, through its operator North America Energy Services Company has undertaken several reliability enhancing initiatives at the Facility. The Facility employs Siemens W501G combustion turbines that are one of the most proven and highly efficient technologies in the market. Operating in the Londonderry Eco-Park, the waste heat from the two gas turbines run an additional large steam turbine to squeeze even more energy efficiency from the process. The cooling water travels from the Manchester Sewage treatment plant instead of being discharged directly into the Merrimack River. After further treatment it is used for cooling with the state of the art plume reduction cooling towers. After use the cleaner water is returned to the Merrimack. Every minute of the day or night, every day of the year the Granite Ridge Power plant pays Londonderry $8.41 a minute in taxes? Add to this State and Federal fees and taxes revenue from the plant is over 5 million dollars. The average homeowner in Londonderry with a $300,000 home pays about 1 cent a minute in taxes. Fun Fact: Each leap year Granite Ridge would pay an extra $12,124 in taxes for that extra day. If taxes were paid by the day, since they pay by the year this “extra day” is free! Granite Ridge Energy is located in the Northern Part of Londonderry near Manchester-Boston Regional Airport. It is located in Londonderry’s Eco Industrial Park. You can also contact Granite Ridge Energy at (603) 432-9114. Like to see more of this power plant supporting New England in your backyard? Press play on the Londonderry Hometown Online News Slide Show. Click on any image for a larger version. Browse this Google map for detailed directions.